So tonight after work I got the 240Z off the trailer, both of which had been parked in the Garage since we moved to Colorado a few weeks ago. I had lined up a storage lot for the trailer and wanted to get it out of the garage. Well the 240Z wasn’t easy to start, took a good 5+ minutes of attempts before it finally started up. Later in the day I realized the MAP hose wasn’t hooked up to the Megasquirt, that would explain the difficulty in starting! whoops. So I dropped the trailer off and came home to organize the garage a bit, moved the newly assembled shelves in place and started going through some of my boxes. After I got bored with the unpacking I decided it was a good time to put all the bulbs and fuses that I had purchased yesterday into the car. That was pretty quick and painless, but didn’t produce any fruit! I didn’t see any lights in the rear of the car at all. So what next? I simply decided to pull the dashboard out! 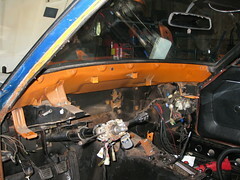 The whole thing, gone, removed, not going back in (likely not) along with the blower and heater core. Why might you ask? Why not. The car will hopefully be somewhat streetable, but I won’t be using most of the gauges on the car anyways. For a speedo I’ll have the G2X (GPS data logging), for RPM I’ll likely have the G2X, or even a Netbook running the Megasquirt software to show me all the appropriate date from the ECU. So why do I need the stock dash? I don’t! Though I did realize after I pulled the dash that I left the fiberlass dashboard in St. Louis, and didn’t bring it to CO. Luckily I’m going back to STL next week for work and will hopefully get it packed up and shipped back. I’ll need to do some creative wiring, hooking up a switch for the headlights, a horn, turn signals, and even the ignition, but I think it will be cool to have all those as switchable items on a nice clean looking dashboard, not the big old clunky stock one. Here’s a photo sans dash.